Pandora Light Pro is an all-around convenient car security, remote start and telemetry system. Built-in 2xCAN, LIN interfaces allow to install the system on almost any car, and the specialized IMMO/KEY port allows you to algorithmically bypass the immobilizers of a large number of cars in order to implement remote engine start. 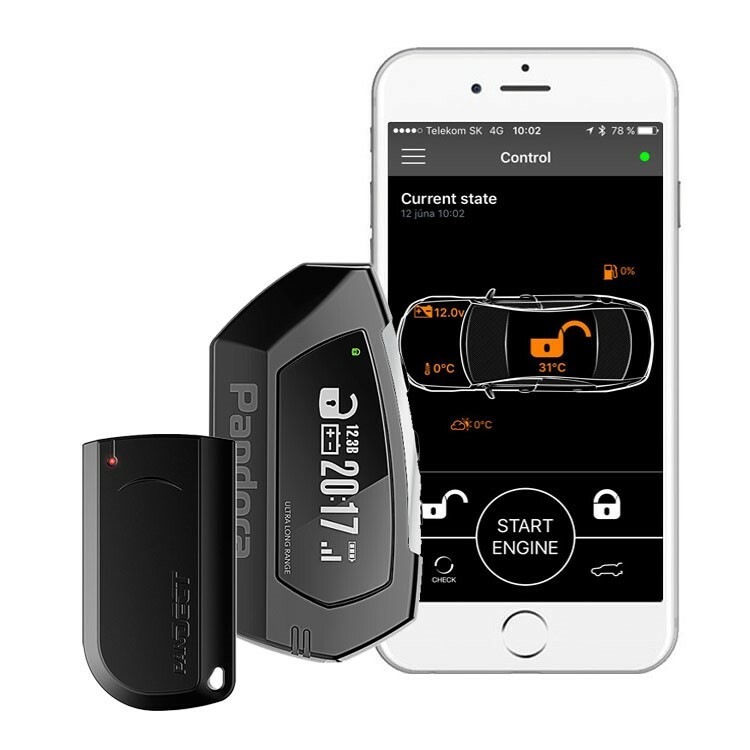 Remote start function allows to configure automatic starts by weekdays, hours, engine temperature, voltage, as well as providing turbo-timer function and remote start directly issued from the remote control. The system has a dialogue encrypted 2-way OLED-display remote control that allows monitoring car parameters and safely issuing dozens of commands. Integrated Bluetooth 4.2 interface allows you to extend your system with a vast variety of additional modules and use your phone to control and adjust your system. Pandora Light Pro allows implementing remote and automatic engine starts. The system reliably controls the main engine parameters and car state during remote start procedure. The flexible and efficient system allows you to start the engine by time, voltage, temperature, on command from the remote control. The automatic engine start procedures operate independently of the presence of communication with the remote control elements of the system. The use of the modern AES encryption algorithm with individual encryption keys of 128 bit length for each system and dynamic dialog information exchange guarantees the impossibility of intellectual hacking in the foreseeable future. Integrated high speed multichannel digital interface (2xCAN + LIN) provides the most functional and safe connection to original digital busses of the vast majority of modern cars. The system contains advanced protocols of the digital data exchange for more than 500 car models. Built-in multifunction IMMO-KEY port and algorithmic bypass of original car immobilizers that supports a special Pandora CLONE server allows the system to bypass or clone an original key for the implementation of automatic and remote engine start on a variety of modern cars. Pandora Light Pro provides the most flexible complex algorithms to control original and additional engine preheaters. The system supports digital protocols of Webasto Thermotop Evo and Eberspacher Hydronic/Hydronic2 preheaters operation via digital LIN-bus. New mobile applications for Android and iOS (Pandora BT) control the main functions of the system (arming/disarming, engine operation, control over engine and engine preheaters operation). The applications provide service information: events history, on-board voltage, engine and interior temperature, fuel level. Pandora BT application allows you to set remote and automatic engine start parameters, shock/tilt/motion sensors sensitivity, it also allows you to adjust radio tags for Hands Free function and use your mobile phone as a radio tag. The system provides a reliable connection with all smartphones that supports Bluetooth 4.0 Low Energy protocol. The system is equipped with a Bluetooth interface that allows you to connect additional modules, radio relays, radio tags; these additional modules greatly expand the functionality of the system. The most modern algorithmic solutions, the latest electronic components and the new MCU Cortex M4 allow you to extend the system’s operation time in “Arm” mode as long as possible without the need to recharge the battery. Pandora Light Pro utilizes Bluetooth 4.2 to connect to a smartphone and transponder tags. Android & iOS app “Pandect BT” is available on Google Play & Apple Store and allows adjusting all the functions of the device and receiving information about its status. The system is built for efficiency –with Bluetooth 4.2 Low Power it consumes very little energy and does not prevent car systems from entering sleep mode.